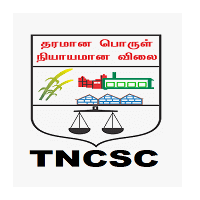 TNCSC Recruitment 2019 – Tamilnadu Civil Supplies Corporation (TNCSC) notifications for the post of Assistant Manager, Shift Engineer. 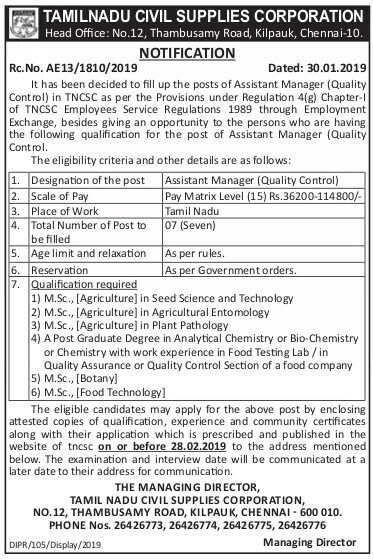 The detailed eligibility criteria and application process of TN Civil Supplies Corporation Recruitment are given in below. Shift Engineer: Diploma in Mechanical Engineering or Electrical Engineering with Two Years Experience in Government Department / Undertaking or in any Engineering firm of repute. Age limit (As on 01.07.2018): As per Govt rules. The selection process will be based on the Written Examination and Interview followed by Documents Verification. 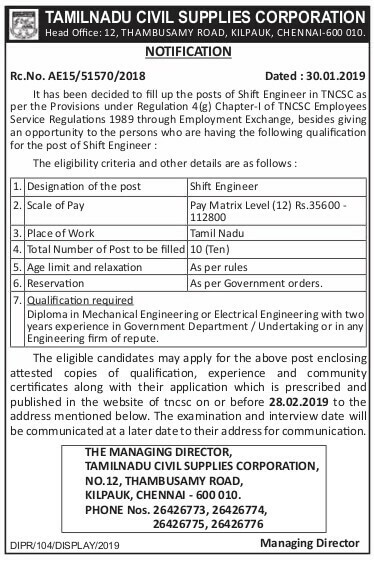 How to apply for TNCSC Recruitment 2019? All interested and eligible candidates may apply post by enclosing attested copies of qualification, experience and community certificates along with their application form in prescribed format to the following postal address on or before 28 February 2019.